As the first seven parts of the rainforest section of the site have described, tropical rainforests are incredibly rich ecosystems that play a fundamental role in the basic functioning of the planet. Rainforests are home to probably 50 percent of the world's terrestrial species, making them an extensive library of biological and genetic resources. In addition, rainforests help maintain the climate by regulating atmospheric gases and stabilizing rainfall, protect against desertification, and provide numerous other ecological functions. However, these precious systems are among the most threatened on the planet. Although the precise area is debated, each day at least 80,000 acres (32,300 ha) of forest disappear from Earth. At least another 80,000 acres (32,300 ha) of forest are degraded. Along with them, the planet loses untold numbers of species to extinction, the vast majority of which have never been documented by science. As these forests fall, more carbon is added to the atmosphere, climatic conditions are further altered, and more topsoil is lost to erosion. Overall, FAO estimates that 10.4 million hectares of tropical forest were permanently destroyed each year in the period from 2000 to 2005, an increase since the 1990-2000 period, when around 10.16 million hectares of forest were lost. Among primary forests, annual deforestation rose to 6.26 million hectares from 5.41 million hectares in the same period. On a broader scale, FAO data shows that primary forests are being replaced by less biodiverse plantations and secondary forests. Due to a significant increase in plantation forests, forest cover has generally been expanding in North America, Europe, and China while diminishing in the tropics. Industrial logging, conversion for agriculture (commercial and subsistence), and forest fires—often purposely set by people—are responsible for the bulk of global deforestation today. But enough about the extent and some of the effects of deforestation. What is responsible for this loss? This is the question this section addresses. Before expanding further on forest loss it is critical to first explain what is considered "forest" and what is meant by deforestation and forest degradation. The Food and Agriculture Organization of the United Nations (FAO), the leading source for information on the status of the world's forests, defines forests as land with a tree canopy cover of more than 10 percent and an area of more than half a hectare. FAO says that "forest" includes natural forests and forest plantations but specifically excludes stands of trees established primarily for agricultural production (i.e. fruit tree and oil palm plantations) and trees planted in agroforestry systems. Other organizations use different standards for defining forests. For example, the United Nations Environment Programme (UNEP) uses 40 percent cover as the threshold for "closed forests" and 10-40 percent cover for "open forests," while the Tropical Ecosystem Environment Observations by Satellite (TREES) project classifies areas with more than 70 percent canopy cover as "dense forests" and those with 40-70 percent cover as "fragmented forest." To reduce confusion, this site will generally follow FAO's convention, even though it has been criticized for its generous definition of what it considers forest. FAO defines deforestation as "the conversion of forest to another land use or the long-term reduction of the tree canopy cover below the minimum 10 percent threshold." Depletion of forest to tree crown cover greater than 10 percent (say from 90 percent to 12 percent) is considered forest degradation. Logging most often falls under the category of forest degradation and thus is not included in FAO deforestation statistics. For this reason, forest degradation rates are considerably higher than deforestation rates. Digging a little deeper, FAO says that "deforestation includes areas of forest converted to agriculture, pasture, water reservoirs and urban areas," but the term "specifically excludes areas where the trees have been removed as a result of harvesting or logging and where the forest is expected to regenerate naturally or with the aid of silvicultural measures." Most forms of logging for timber harvesting, especially "selective logging"
Throughout their existence, tropical rainforests have been affected by natural forces like fire, drought, and storms. These events occur on a random basis and can damage large stretches of rainforest. However, the damage caused by these natural occurrences is generally different from that caused by human activities; namely in that the forest loss is not complete and parts of the ecosystem continue to function. From the surviving remnants of the ecosystem, the forest can usually rapidly regenerate. Within a few years, the forest diversity can return to or exceed the diversity that existed before the disturbance. Some studies have suggested that these periodic occurrences are an important ingredient to a forest's diversity. Without these events, scientists believe, some forests cannot reach their fully dynamic state. Researches have found that forest turnover rates may be as short as 65-135 years. Natural forest fires [news] occur in rainforests, despite their humid nature. Generally, when forest burns in smaller fires, ground vegetation, shrubbery, saplings, and smaller trees are eradicated, while the larger canopy species are spared. The fire has the effect of clearing the forest floor and weaker trees, thus allowing new growth. A forest, stressed by drought or some other factor, is most susceptible to fire, usually sparked by lightening or small human fires that escape neighboring agricultural zones and burn out of control. For example, the great Bornean fires of 1982-83, destroyed more than 9 million acres (3.6 million hectares) of forest (2.81 million ha of dipterocarp forest) in Kalimantan (Indonesia). These fires, like the wildfires of 1997-98, was ignited by land-clearers setting fires in and around forest heavily degraded by logging under el Niño-induced drought conditions. Research has recently found that over half the Amazon rainforest is at risk of burning during extreme droughts, like the one that struck from July—November in 2005. Volcanic eruptions and subsequent lava flows sometimes burn large tracts of forest, while the gases released from the activity can kill wildlife. An interesting phenomenon, documented by a National Geographic expedition in the Democratic Republic of the Congo's Virunga National Park, and undoubtedly in other areas with volcanic activity, involves carbon dioxide, a gas that is poisonous in high concentrations. Since carbon dioxide is heavier than air and tends to hug the ground, it forms deadly sink areas when released via volcanic vents. In these areas, green grass grows vigorously due to the abundance of C02 and the lack of herbivores, which are attracted to the untouched grass, but are quickly asphyxiated by the toxic gas. Other animals come, including predators attracted to the dead animals, but they, too, perish. The sink becomes a death trap. However, these carbon dioxide sinks are rare, so they do not pose a major threat to most animals. In 1999, lava flows in Cameroon destroyed sections of virgin rainforest, while there is evidence of large-scale lava damage in the rainforests of Costa Rica. On Java, one of the last surviving tracts of lowland rainforest only exists today because of volcanic activity. When Krakatoa exploded in 1883, the resulting ash fallout and tsunami killed everyone living in the area that is now Ujung Kulong National Park. Fear of future calamity left the area uninhabited, allowing forest to regrow and providing the Javan rhino — the world's rarest rhino — a refuge on an island that has been nearly entirely converted for human use. Drought [news] can affect forests by weakening the system to the point where it is more susceptible to other events like fire and disease. Drought is often partially induced by human activities like deforestation, but it is also a natural occurrence, like El Niño, which periodically causes drought in Asian and American tropical rainforests. El Niño is usually named as one of the influences behind the great Bornean fires of 1982-1983 and 1997-1998. Drought initially weakens canopy plants by reduction of local humidity and rainfall. If the drought is long enough, the leaf litter dries out, killing off decomposers and reducing the effectiveness of nutrient recycling within the system as a whole. Drought can bring benefits to the forest. Studies have shown that El Niño may enhance fruit production in forests affected by seasonal differences in rainfall. El Niño events produce dry sunny years in Central America, northern South America, the Amazon, Malesia (Indonesia and Malaysia), New Guinea, parts of equatorial west Africa, and India. The reduced cloudiness is beneficial to fruit production in that higher levels of photosynthetically active radiation (PAR) reach plants. El Niño and high levels of PAR have been associated with mast fruiting. However it is a different case in the years following El Niño events since dry, sunny El Niño events tend to alternate with wet, cloudy years in the tropics. In addition, high fruit production consumes stored reserves for plants, limiting the next reproductive event. Many scientists are concerned that climate change could worsen droughts in the Amazon. In 2005, the accumulation of warm waters in the tropical Atlantic helped fuel a record hurricane season while reducing the availability of moisture to the Amazon basin. These conditions could worsen as global temperatures increase. Research published in December 2005 suggests that warmer sea temperatures in the tropical Atlantic are likely to become increasingly prevalent as currents normally carrying warm water from equatorial regions towards the Arctic weaken. One simulation by researchers at the University of Illinois, Urbana-Champaign, found that 45 percent chance that existing water currents in the North Atlantic Ocean could shut down by the end of the century if nothing is done to slow greenhouse gas emissions. Such a collapse of the so-called "Atlantic heat conveyor belt" could plunge parts of Europe into significantly colder winters while exacerbating drought conditions in equatorial Africa. Back in the Amazon, the usually moist rainforest could become drier and more susceptible to forest fires. Storms can cause extensive damage in the rainforest through tree falls. When a canopy or emergent tree falls, dozens of other neighboring trees, attached by lianas, are brought down with it. Surveying the forest following a storm can reveal numerous tree falls, light gaps, and fallen matter including epiphytes and branches. However, a healthy forest can recover from moderate storm damage in a matter of months or years. The "light gaps" are quickly colonized and soon filled by canopy trees, while the fallen matter is decomposed and reabsorbed back in to the system. Larger tropical storms, such as hurricanes (cyclones or typhoons), can cause substantial damage to rainforest and recovery may take decade to centuries. For example, in 1880 unusually strong winds damaged large areas of Kelantan forest in the northwestern part of peninsular Malaysia. A study in the 1950s found the most common tree species were still characteristic of secondary forest and dipterocarps—typical of southeast Asian rainforest—remained sparse. Similarly, recovery from Hurricane Hugo (1989) for the Luquillo montane forest in Puerto Rico is expected to take at least 250 years. The greatest cause of tropical rainforest destruction today comes from human activities, which, unlike natural damage, are unrelenting and thorough. Although most of this deforestation is driven by national and international economic forces, a significant proportion serves no long-term purpose; it results from subsistence activities on a local level. Many of the effects from human-induced destruction of the rainforests are probably irreversible within our time. The role of humans in the deforestation of the world's forests is considerable and extensive. Many activities contribute to this loss including subsistence activities, oil extraction, logging, mining, fires, war, commercial agriculture, cattle ranching, hydroelectric projects, pollution, hunting and poaching, the collection of fuel wood and building material, and road construction. Under current practices, extractive industries (timber, oil, and mineral) promote the development of short term booms that encourage settlement. These booms and resulting settlements can attract large numbers of poor seeking a better life. They clear the surrounding land for agriculture and livestock. Meanwhile, the forest resource, whether it be oil, timber, or minerals, is rapidly depleted with little consideration for the long-term consequences. Once the resource is exhausted, developers move on to new areas, leaving behind a degraded environment and settlers with few livelihood options. Where forest remains, it may be cleared for subsistence agriculture. Most extractive processes in the rainforest are not sustainable as currently practiced. Like most environmental assets, rainforests are endangered by their status as open-access resources or as common property. (Designating rainforests as open-access resources is not entirely accurate, in light of the lack of formal property rights in certain countries and the limited capacity of many governments to manage and regulate the rainforest lands. However, treating rainforest as such is adequate for this discussion). Under open access, no group has exclusive use of rainforest resources, but essentially everyone enjoys access to the resource. There is little incentive for conservation with the mentality of "If I do not get the resource someone else will," and forest is depleted by industry and small farmer alike. In addition, economic incentives like subsidies and tax breaks for forest developers distort the direct costs of harvesting and converting tropical rainforests. The result is market failure, where the prices for tropical timber products and other goods derived from rainforest destruction do not reflect the full environmental costs of the loss of goods and services provided by the ecosystem. Therefore, by offering these incentives, the government effectively makes it profitable for firms to convert forest for development purposes where it normally would not be profitable. A good example of this is the pulp and paper industry in Indonesia. The Ministry of Forestry grants large supplies of cheap fiber in the form of large forest concessions to pulp and paper companies. The companies don't have to pay for the "externalities" like carbon emissions, biodiversity loss, or water pollution. Instead it is society as a whole that bears the costs. In the 1980s and 1990s another contributor to commercial forest destruction was the outstanding debts of developing countries, which caused them to seek quick ways to raise revenue to make debt payments. This is diminishing in importance today. However, the fundamental underlying cause of deforestation is population growth, both in developing countries, which depend on forest lands for sustenance, and in developed countries, which demand products made from forest resources. We humans have always cleared the forest for our own interests, but in the past, the process was slow and only limited regions were deforested, generally for subsistence agriculture. Today humanity is far more efficient at clearing the forest and the push for short-term profit is a powerful motivator for forest conversion. A third to two-fifths of tropical deforestation is caused by subsistence activities on a local level by people who simply use the rainforest's resources for their survival. Having neither the money nor the political power to acquire holdings on productive lands, these transient settlers follow and settle along roads constructed in the rainforest by development or extractive firms. After cutting trees for building material, these people use the slash-and-burn technique to clear the surrounding forest for short-term agriculture. First, understory shrubbery is cleared and then forest trees not used as construction material. The area is left to dry for a few months and is then burned. The land is planted with crops like bananas, palms, manioc, maize, or rice. After a year or two, the productivity of the soil declines, and the transient farmers press a little deeper and clear additional forest for more short-term agricultural land. The old, now infertile fields are left for waste or sometimes used for small-scale cattle grazing. Although this sort of slash-and-burn agriculture has been used for centuries by indigenous peoples, the practice has been carried out in a careful, small-scale, rotational manner, which ensures relative sustainability. In the past the clearing was left idle for 20 to 100 years, so the forest could recover and again provide fertile land and useful timber. The situation is different today. So many people are practicing slash-and-burn agriculture in a non-rotational manner that fields do not have time to return to secondary forest as they do after natural disturbances. The clearing cycles are becoming shorter and shorter, and in some cases it is only 5-8 years before the forest scrub is again cleared. Eventually, the rainforest ecosystem fails and is replaced by tough grasses which can tolerate the short cycles. The colonizer not only brings his fire to the rainforest, but also his domestic animals and diseases. Domestic animals decimate local wildlife by infecting them with disease and eating their young, while local indigenous peoples, where they exist (mostly limited to remote parts of the Amazon today), can be infected by the colonists' diseases. When not actively burning forest for agricultural clearing, the colonizer cuts fuel wood and hunts wildlife for food. It is not solely the fault of the landless peasants for their plight; the unequal distribution of land and inability of the government to provide sufficient legal mechanisms for them to gain title to land are also to blame. These people have few options, and without a better alternative they will continue to do what they must to survive: destroy the forest. This subsistence activity on a local level is the greatest threat to the future of the rainforest and the most difficult to address, especially in regions with fast-growing populations. Historically the colonization of rainforest land was encouraged by tropical governments that funded programs to move urban poor out of cities to the "unclaimed" forest areas. The programs were facilitated by laws that allowed the free ownership of forest lands simply by clearing and occupying them. In the 1970s, 1980s, and 1990s these programs often contributed to conflict between colonists and traditional forest dwellers. Further incentives came from the development of roads that opened up once remote forests to settlement. Brazil and Indonesia had the largest state-backed colonization schemes. Indonesia's was known as the transmigration program, which aimed to alleviate some of the population pressures of the central islands, acquire resources, and establish regional hegemony over local populations that may harbor ambitions for political autonomy. Transmigration continues today but is much diminished from its peak in the 1970s and 1980s. In recent years economic globalization has brought about profound changes in countries around the world. Generally there has been a trend of decentralizing government and reducing the role that government plays in the everyday life of its citizens. In developing countries, this shift has implications for tropical forests. Whether determined by a market economy or dictated by a command economy, management of forest land has usually been the responsibility of public forest services. Forest exploitation firms have dealt through these bureaucracies, which generally ensure some sort of control over the allocation of forest lands. Today the governments of many developing countries have decentralized their control over the forestry sector and privatized many of the state-owned forest industries. The budgets of national forest services have been reduced and management has been transferred to local governments, private firms, and organizations, and NGOs. This transfer brings decision making closer to the local level where policy can be more responsive to local conditions, but can also result in new challenges, like compliance with environmental laws and elevated risk of corruption. Research published in 2011 found that decentralization in Indonesia contributed to the country's high deforestation rate — the study concluded that politicians in forest-rich districts seem to repay their election debts by granting forest concessions. Privatization associated with decentralization is also controversial in some circles, especially in cases whether corporations aren't responsive to local concerns or acquire rights to convert lands that are traditionally used by local communities. Usually the government — whether local, state, or national — is ultimately at fault for failing to recognize historic land use and granting problematic concessions, but the situation can be worsened when a firm employs heavy-handed tactics, like private security forces, to displace traditional land users or buys land from individuals within a without proper consent from the community. Even with some negative impacts, decentralization can be beneficial for forest management. Many tropical governments have proven themselves incapable of effectively managing forest resources — local governments, private companies operating within the proper regulatory environment, local communities, and NGOs may do a better job. For example, land turned over by the Ministry of Forestry to local communities on the island of Java has led to forest recovery. Local communities have a direct incentive to steward land when they own it collectively. That's not the case for state lands. The trend toward globalization — where commodities produced in the tropics are shipped to markets around the world — is putting new pressures on forests. With booming commodity prices due to growing affluence and the inexorable rise in global population, demand for land is greater than ever. Land buyers are usually the entities with the most money — companies in the big agriculture, oil, timber, and mining sectors. Solid yellow indicates blocks already leased out to companies. Hashed yellow indicates proposed blocks or blocks still in the negotiation phase. Protected areas shown are those considered strictly protected by the IUCN (categories I to III). 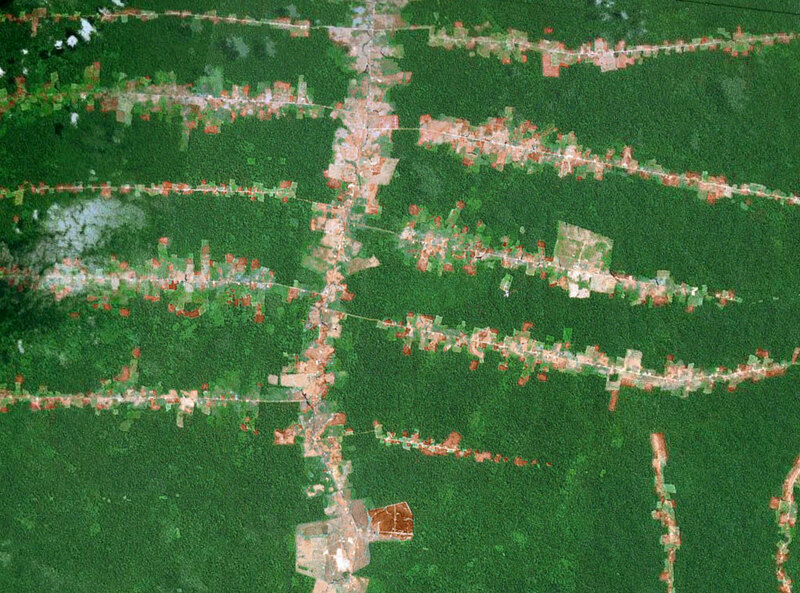 Image modified from Finer at al (2008) Oil and Gas Projects in the Western Amazon: Threats to Wilderness, Biodiversity, and Indigenous Peoples. A 2008 study published in Environmental Research Letters found that 41 percent of the Peruvian Amazon was covered by 52 active oil and gas concessions, nearly six times as much land as was covered in 2003. Logging is one of the most prominent and best-known forms of rainforest degradation and destruction. Despite improved logging techniques and greater international awareness and concern for the rainforests, unsustainable logging of tropical rainforests continues—much of it practiced illegally by criminal syndicates. In the late 1990s, after depleting much of their own timber stocks, Asian logging companies began aggressively moving into rainforest areas including northeastern South America (Guyana, Suriname); the Brazilian Amazon; the Congo Basin of Central Africa; the South Pacific, particularly the Solomon Islands and Papua New Guinea; and Central America. Chinese timber firms have been particularly active during that period and the early 2000s, after the government banned domestic logging in much of the country following catastrophic flooding in 1998. With a construction boom fueling demand for wood, China has been linked to logging in Africa, the Amazon, Burma, and Indonesia. However due to depletion of timber stocks, overseas timber operations in the 2000s and 2010s were increasingly replaced by plantation forestry, both timber and oil palm plantations. Typical logging operations are quite damaging to the rainforest ecosystem. Problems stem from the nature of limited-term timber concessions, which encourage short-term resource depletion, and poor forest planning and management. Corruption is rife in many tropical timber-producing countries, making existing forestry laws nearly unenforceable, while lack of transparency in commercial transactions means that corrupt officials can grant concessions to cronies without regard for the environment or consideration of local people. The structure of the rainforest itself—where no one species dominates and attractive timber trees are widely dispersed—means that it can simply be more profitable to clear- cut forest. Even without clear-cutting, the construction of logging roads to reach forest resources is destructive in the its own right and encourages settlement of previously inaccessible forest lands by speculators, land developers, and poor farmers. Studies by the Environmental Defense Fund show that areas that have been selectively logged are eight times more likely to be settled and cleared by shifting cultivators than untouched rainforests because of the access granted by logging roads. Research has found a high correlation between the presence of logging roads and consumption of "bushmeat"—wild animals hunted as food. 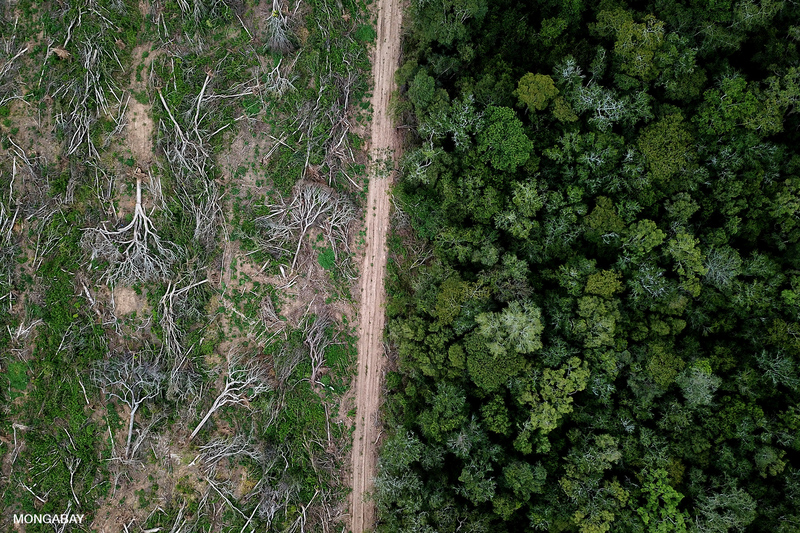 Logging roads aside, selective logging itself—where only one or two valuable tree species are harvested from an area—can take a heavy toll on primary tropical forests. A late 2005 study conducted by scientists from the Carnegie Institution at Stanford University determined that "selective logging" creates twice as much damage as is detected by satellites while resulting in 25 percent more greenhouse gas emissions than previously believed. Selective logging—as usually practiced—degrades forest because the felling of a single large tree can bring down dozens of surrounding trees which are linked to the target tree by vines and lianas. The thinning of the protective canopy exposes the forest to increased sunlight and drying winds that can kill symbiotic soil organisms essential for decomposition and nutrient-fixing, while drying leaf litter and increasing the forest's vulnerability to fire. Further, the use of tractors for removing trees tears up the soil and increases erosion. Selective logging has been found to reduce global biodiversity by destroying habitat for primary forest species. These tropical logging operations widely fail to safeguard timber stocks for future harvests and fail to protect logged-over forest from fire, biodiversity loss, over-hunting, and subsequent conversion for agriculture or pasture. But the damage caused by clear-cutters is even worse. Operators who do not practice selective logging may instead simply burn a forest tract after valuable trees have been removed. Developing countries often see only a fraction of the money generated legal logging operations, and even less from illegal logging, which, according to World Bank estimates, costs governments about US$5 billion in lost revenues annually and hits national economies for another US$10 billion per year. Logging firms can often find or create loopholes in legislation that allow them to pay very little for concessions while sometimes avoiding excise taxes on the logs they remove. For example, a 1994 logging agreement in Suriname granted 25 percent of Suriname's land area (7.5 million acres or 3 million hectares) at less than $35 an acre, while lacking provisions to safeguard the environment, reforest logged areas, or even allow the country to adequately monitor logging activities. Estimates at the time from the U.S. Forestry Service and Harvard Law School projected that while loggers would earn some US$28 million annually, the country would only see US$2 million. That logging contract was subsequently canceled due, in part, to public outcry. Meanwhile, in the late 1990s, the Cambodian government was losing so much revenue from its failure to collect taxes on timber that the IMF canceled a $120 million loan and the World Bank suspended direct aid to the government until the corruption in the forestry sector was resolved. Apparently these actions were not enough to stem forest loss: between 2000 and 2005, Cambodia lost nearly 30 percent of its primary forest cover. In Nigeria, which suffered the highest rate of primary forest loss (55.7 percent) in the first half of this decade, WEMPCO, a Hong Kong logging firm, in the 1990s reportedly paid US$28 to the government for each mahogany tree while reselling the wood at US$800 per cubic meter, roughly US$2,900 per tree. Tropical countries also lose potential revenue by exporting logs before processing, when wood has its lowest value. Several countries, including Cambodia, the Solomon Islands, and Burma, in the 1990s banned raw log exports in an effort to increase revenue for local operators and the government, but raw logs are still commonly smuggled by crime syndicates in several countries. Sustainable forestry is possible, but according to the International Tropical Timber Organization (ITTO), more than 90 percent of tropical forests are managed poorly or not at all. Several techniques like strip logging and reduced impact logging (See Ch 10: Solutions: "sustainable logging") show potential, but do little good if they are not adopted. Further, studies have show that once logged, forest has a much higher likelihood of eventual deforestation due to road construction, increased risk of fire, and over-extraction of valuable species. Rainforest logging operations are also particularly subject to "greenwashing" where a firm claims to be committed to sustainable harvesting techniques but in practice is failing to implement the most basic safeguards. Vast swatches of rainforest have been chopped down to supply the pulp and paper industry. Typically valuable trees are harvested first. The forest is then leveled with remaining trees sent to a mill where they are chipped into pulp, which is either exported or turned into paper. The cleared land is then planted with eucalyptus or acacia, which is harvested on a 6-8 year cycle. When timber prices are high, a pulp and paper company may sell the tree trunks for timber and only use the branches and other fiber for pulp. Since the mid-1990s the majority of deforestation for pulp and paper production in the tropics has occurred in Indonesia, primarily on the island of Sumatra. In fact, the pulp and paper industry is one of the biggest drivers of deforestation in Indonesia, accounting for roughly 20 percent of deforestation in the 2000s and 50 percent of peatlands conversion. Due to the high rates of peat conversion for plantations, the pulp and paper sector was estimated in 2009 to generate more than 600 million tons of carbon dioxide emissions per year, more than 70 percent of which result from peat. Among major commodities, pulp and paper has the highest emissions per dollar of of commodity produced — higher than conversion of peatlands for oil palm or rainforest conversion for soy or cattle ranching. Two major companies account for 80 percent of Indonesia's pulp and paper production: Asia Pulp & Paper (APP) [owned by the multinational Sinar Mas conglomerate] and Asian Pacific Resources International Holdings Limited (APRIL) [owned by the Singapore-based Royal Golden Eagle Group]. Both have been heavily criticized by environmentalists and conservation scientists for their forest management practices. Both have also been accused of greenwashing their image, claiming their operations do little harm to the environment. APP has even backed astroturf groups — fake organizations set up to support a corporation's messaging strategy — in Canada and the United States to go after environmental groups that have criticized it and companies that have stopped buying its products. Eyes of the Forest, a coalition of Indonesian NGOs, estimates that APP and APRIL cleared 2 million hectares of natural forests in Riau, accounting for nearly half the Sumatran province's recent forest loss. Paper products sold by APP and APRIL are available in markets around the world. However since 2009, Greenpeace, the Rainforest Action Network (RAN), and WWF have waged a campaign against companies that source paper, cardboard and other products from these companies, especially in Europe, Australia, New Zealand, and the United States. Dozens of corporations have since stopped buying from APP and APRIL. 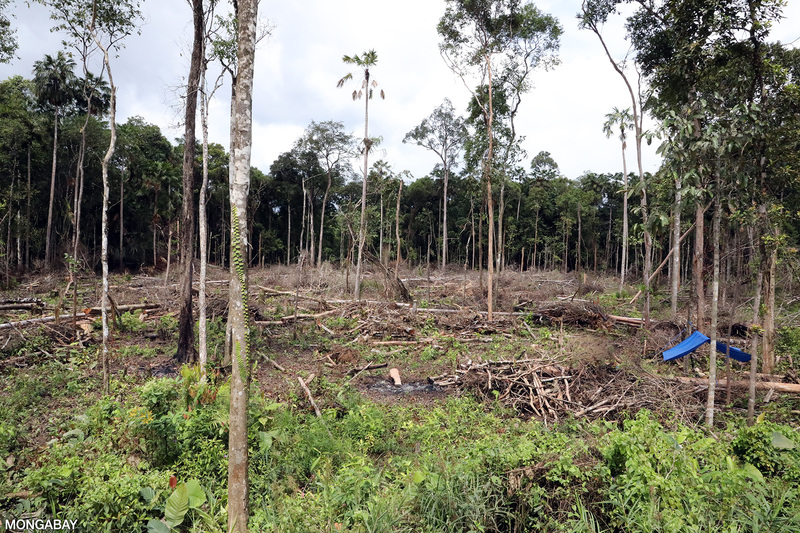 In response to these campaigns and criticism, APP and APRIL have both recently adopted "zero deforestation" policies that bar conversion of natural forests and peatlands for plantations. More details on these commitments can be found in the news feed below. In the Amazon rainforest most mining today revolves around alluvial gold deposits. Due to the meandering nature of Amazon rivers, gold is found both in river channels and on the floodplains where rivers once ran. These deposits are actively mined by large-scale operators and informal, small-scale miners. Both operators rely heavily on hydraulic mining techniques, blasting away at river banks, clearing floodplain forests, and using heavy machinery to expose potential gold-yielding gravel deposits. Gold is usually extracted from this gravel using a sluice box to separate heavier sediment and mercury for amalgamating the precious metal. While most of the mercury is removed for reuse or burned off, some may end up in rivers. Studies have found that small-scale miners are less efficient with their use of mercury than industrial miners, releasing an estimated 2.91 pounds (1.32 kg) of mercury into waterways for every 2.2 pounds (1 kg) of gold produced. While there is no scientific consensus on mercury contamination in the Amazon, according to biologist Michael Goulding, there is evidence of mercury causing problems in other ecosystems. Elemental or inorganic mercury can be transformed (methylated) into organic forms by biological systems and enter food chains. Not only are methylated mercury compounds toxic, but highly bioaccumulative, meaning that mercury concentrations increase up the food chain. Top predators, including otters, birds of prey, and humans, will have the highest levels of mercury in their systems. Those who eat large amounts of fish are at the greatest risk. Other toxic compounds are used and generated in the mining process as well. Mining exposes previously buried metal sulfides to atmospheric oxygen causing their conversion to strong sulfuric acid and metal oxides, which run off into local waterways. Oxides tend to more soluble in water and contaminate local rivers with heavy metals. Cyanide, a highly toxic compound, is also often used to separate gold from sediment and rock. While cyanide is supposed to be carefully monitored to prevent its escape into the surround environment, spills do occur—especially when there's no one around to enforce mining regulations. The effects of poisoning can be widespread, especially when a waste-holding pool overflows or breaks, as it did in Guyana in August 1995. The Guyana spill made international headlines for its magnitude—over one billion gallons (four billion liters) of cyanide-laced waste water was released into a tributary of the Essequibo— and its effects, causing widespread die-offs of aquatic and terrestrial plant and animal life, poisoning floodplain soils used for agriculture, polluting the main source of drinking water for thousands of people, and striking a blow to the emerging eco-tourism industry on the river. The mine, run by Golden Star Resources of Denver and Cambior of Montreal, at first tried to cover up the spill by burying fish carcasses. Six days after the spill, after locals found dead wildlife, the mine reported the accident to the Guyana government. Despite the damage inflicted by the spill, the government granted additional mining concessions on the New River shortly thereafter. Large-scale mining operations, especially those using open-pit mining techniques, can result in significant deforestation through forest clearing and the construction of roads which open remote forest areas to transient settlers, land speculators, and small-scale miners. These settlers and miners are probably a greater threat to the tropical rainforest environment than industrial mining operations. Wildcat miners enter regions rumored to have gold deposits and clear forest in search of riches. They hunt wildlife, cut trees for building material and fuelwood, and trigger erosion by clearing hillsides and detonating explosives. Miners can also bring diseases to local indigenous populations (where they still exist) and battles over land rights. One well-documented example is the conflict between the Yanomani Indians of Northern Brazil and Venezuela and garimpeiros—illegal Brazilian miners. Reports indicated that Yanomani populations have fallen significantly since the first incursion of miners in the 1980s. While deforestation and chemical pollution from mining can impact the rainforest environment, downstream aquatic habitats fare worse. Increased sediment loads and reduced water flows can seriously affect local fish populations. Freeport-McMoRan, based in New Orleans, has operated the Grasberg gold, silver, and copper mine in Indonesian New Guinea (formerly Irian Jaya), since 1972, converting Mount Ertsberg into a 600-meter hole. As documented by the New York Times and dozens of environmental groups, the mining company has dumped substantial amounts of waste into local streams, rendering downstream waterways and wetlands "unsuitable for aquatic life." Relying on large payments to military officials, the mining operation for most of its history was protected by a virtual private army that were implicated in the deaths of an estimated 160 people between 1975 and 1997 in the mine area. Freeport estimates that it generates 700,000 tons of waste a day and that the waste rock stored in the highlands—900 feet deep in places—now covers some three square miles. Government surveys have found that tailings from the mines have produced levels of copper and sediment so high that almost all fish have disappeared from nearly 90 square miles of wetlands downstream from the operation. Cracking down on the Freeport's environmental abuses and questionable human-rights practices has proved a challenge since the mine is one of the largest sources of revenue for the Indonesian government. An Indonesian government scientist wrote that "the mine's production was so huge, and regulatory tools so weak, that it was like 'painting on clouds' to persuade Freeport to comply with the ministry's requests to reduce environmental damage," according to a December 27, 2005, article in the New York Times. For more take a look at "Below a Mountain of Wealth, a River of Waste" in the New York Times. The article was written by Jane Perlez and Raymond Bonner..
Rainforests are increasingly susceptible to forest fires today due to degradation from selective logging, fragmentation, and agricultural activities. Scientists are concerned that much of the Amazon is at risk of burning, and that in the future we could see fires similar to those that so damaged Indonesia in recent el Niño years. Today most rainforest fires originate in nearby pasturelands and agricultural fields where fires are used for land clearing and crop maintenance. Every year, during the burning season, tens of thousands of fires are set by land speculators, ranchers, plantation owners, and poor farmers to clear bush and forest. Under dry conditions these agricultural forests can easily spread into neighboring rainforest. Low-level fires in the rainforest are not unusual. Even in "virgin" forests, fires may burn across thousands of acres of forest during dry years. The distinction between these fires and the fires that forests are increasingly experiencing today is the frequency of occurrence and level of intensity. Natural fires in the Amazon generally do little more than burn dry leaf litter and small seedlings. Typically these fires have flames that only reach a few inches in height and have virtually no impact on tall trees or the canopy itself. However, in passing, the fire sets the path for recurrent fires and subsequent forest loss. Once-burned forests are twice as likely to be deforested as unburned forests, largely because the initial fires—however small—thin out the canopy, allowing more desiccating sunlight to reach the forest floor. Previously burned forests, in addition to having more combustible material, are also often adjacent to fire-maintained pastures and therefore are frequently exposed to sources of ignition. Subsequent fires burn with increased velocity and intensity and cause higher tree mortality. Fires intervals of less than 20 years may eliminate all trees in the forest stand. Under "normal" rainfall and humidity conditions most of these fires are extinguished by the arrival of the rainy season or monsoon. Usually virgin forests serve as a sort of humid barrier which prevents the spread of agricultural fires. However, under dry conditions—such as those of an el Niño year—fires can spread from pastures and fields into primary forest. In the 1990s, 90 percent of burning in the Brazilian Amazon occurred in El Niño years. The unusually strong El Niño of 1997-98 contributed to massive forest fires. In the Amazon, humidity in the Basin was 45-55 percent lower than usual and the Woods Hole Research Center estimated that 400,000 square kilometers of forest could go up in smoke during the burning season. In early 1998, some of these fears materialized as 13,200 square miles (34,000 square km) of Roraima state in northern Brazil burned. The fires, started by subsistence farmers, spread rapidly across the dry savanna and advanced into rainforest usually too humid to burn. As many as 3,800 square miles (10,000 sq km) of intact rainforest were damaged or destroyed by these fires. The government firefighting efforts had virtually no effect and it was only freak heavy showers that extinguished the flames. Dry conditions again returned in 2005, when the Amazon experienced the worst drought in recorded history. As rivers went dry and communities were left stranded, tens of thousands of fires burned. That calamity was topped in 2010 by an even worse drought that affected a million square kilometers of Amazon forest. In both of these droughts, dry conditions were linked not to El Niño but to warm temperatures in the tropical Atlantic Ocean, raising fears that climate change could worsen droughts in the Amazon. Besides destroying the rainforest ecosystem and killing wildlife, these fires create other environmental problems. The "burnings" release thousands of tons of carbon into the atmosphere and the smoke produced causes local airport closings and hospitalizations for smoke inhalation. These fires are significant sources of greenhouse gases. For example, in a four-month period (July-October) in 1987, about 19,300 square miles (50,000 sq. km) of the Brazilian Amazon burned in the states of Para, Rondonia, Mato Grosso, and Acre. The burning produced carbon dioxide containing more than 500 million tons of carbon, 44 million tons of carbon monoxide, and millions of tons of other particles and nitrogen oxides. The tropical forest fires that have made headlines of late will only worsen as more forest is degraded and the area of previously burned forest expands. A study by IMAZON (the Institute for Man and Nature in the Amazon) found that for every acre burned or cleared which shows up on satellite, at least one-acre burns undetected under the forest canopy. These leaf-litter fires can burn for months with warm temperatures and little rain, and subsequent fires in these previously burned areas are more intense and destructive. Other studies have warned that climate change could significantly dry forests in the Amazon Basin and Africa, increasing their risk of burning. In light of this potential scenario and to better understand the impact of extended drought in the Amazon and the resilience of the forest to fire, the Woods Hole Research Center and NASA are have conducted an extensive series of large-scale experiments in the Brazilian rainforest. Separate findings from NASA suggest that heavy smoke from Amazon forest fires inhibits cloud formation and reduces rainfall. This conclusion, combined with other NASA studies suggesting that deforestation can affect regional climate, means that the Amazon rainforest may be on the verge of a significant environmental transformation—one that will increasingly leave the ecosystem vulnerable to fire. War can be a blessing in disguise or a curse to the rainforest, depending on the course of events that surrounds the war, and the situation before the outbreak of the war. War brings panic, disorganization, and concerns of survival above most commercial activities—circumstances that can help protect the rainforest by keeping people from destroying it. War may bring the downfall of governments that sell rainforests assets to service debt payments and finance for weapons purchases, as well as the departure of foreign investors from the country, leaving operations at a standstill. Such was the case with the civil war in Liberia during the late 1990s, where wealthy businessmen fled the country, resulting in the shutdown of commercial exploitation activities in the forests. Continuous warfare, like that of Mozambique from 1977-1992, also has the effect of keeping foreign investors uninterested in risking their capital in investment schemes that could use the forests for economic returns. Fighting and safety may preoccupy people more than hunting, the collection of fuelwood, and slash-and-burn agriculture, so forest can benefit from the absence of these activities. Many times, rural areas are evacuated and poor farmers crowd into urban areas or refugee camps, relieving some of the pressure on forests. Another deterrent to rainforest exploitation is the guerrillas who sometimes hide out in the rainforest. In places like Vietnam, Cambodia, Laos, Mozambique, and Angola, so many land mines were laid that people were at risk of detonating them each time they set forth in the forest. So people who might have exploited it usually avoided the forest. Forests are generally safest during wars when the country has a low population density and thus few human population threats to the forest. However, in countries where population puts pressures on the natural resources, rainforests and wildlife may be decimated by war. Where governments may have worked to preserve forests through some form of park structure, the disappearance of structure can result in the total failure of parks. For example, in Rwanda, where the appalling Tutsi-Hutu ethnic civil war resulted in the deaths of hundreds of thousands of civilians, wildlife suffered from the movement of refugees. While the actual warfare did little damage to the forest, subsistence hunting and fuelwood collection from refugee camps devastated Virunga National Park in the Democratic Republic of the Congo (formerly Zaire). More than 750,000 refugees who were crowded into an unsanitary camp put tremendous pressures on park resources and more than 20,000 acres of protected area were deforested. Four out of the five habituated mountain silverback gorillas in the park were killed while other wildlife was hunted with machine-guns. Exiled Tutsis returned with livestock to graze the countryside, further damaging sensitive areas. The chaos of the late 1990s in the Democratic Republic of the Congo seriously impacted the conservation institutions and national parks of the country. Four world heritage sites—Virunga National Park, Garamba N.P., Kahuzi-Biega N.P., and the Okapi Wildlife Reserve—were affected by the rebels, and park facilities were looted by fleeing government troops. Still wildlife fared pretty well in some places due to heroic efforts by rangers. For example, in 2005 Corneille Ewango of the Wildlife Conservation Society was awarded the prestigious Goldman Environmental Prize for risking his life to protect the Okapi Faunal Reserve from incursions by rebel militias. The presence of guerrilla fighters in the rainforest sometimes causes the government to take steps to destroy their refuge, using defoliants and clear-cutting to expose their strongholds. Such is the case in Burma and Sri Lanka where rainforest is destroyed for this purpose. At other times, fighting is carried out in the rainforest, resulting in damage from gunfire, explosives, and soldier movement, as in the forested Chiapas state of Mexico during the early and mid-1990's. In some countries, like Thailand and Colombia, forestry officials were actively targeted by rebels. Here, where logging was often carried out illegally for timber barons, any government employee is seen as the enemy. For example, in Thailand, where logging of native forests was banned in 1988, timber barons in the 1990s and early 2000s were known to hire armed gangs to illegally harvest trees from reserves. After a series of shootings, unarmed forestry officials avoided confrontation by staying out of these areas. The situation in Thailand illustrates a problem facing park rangers and forestry officials worldwide: how to confront heavily armed bands of illegal loggers and poachers. Is protecting a forest worth your life? Guerrillas and rebel groups also target oil installations, pipelines, and mining operations. The resulting oil and chemical spills can have serious environmental consequences, polluting local streams and rivers and affecting wildlife. For example, the the Caño Limon-Covenas oil pipeline in eastern Colombia was attacked 498 times in its first 11 years of operation, while oil operations are routinely damaged in the Niger River delta in Nigeria. Military outposts constructed to establish a physical presence deep in the rainforest can also result in forest clearing. Roads linking outposts to urban areas can trigger settlement by colonists seeking land for subsistence agriculture. Finally, in some places guerrilla movements have deterred activities that drive deforestation. The FARC insurgency in Colombia was a major reason why vast parts of Colombia has not been logged or converted for industrial agriculture from the 1980s until the mid-2000s. During that period Colombia had one of the lowest deforestation rates in Latin America. Yet aerial coca-eradication spraying programs had other negative effects on forests, killing all vegetation and posing long-term health risks to farmers. Agricultural use of some rainforest land proves to be a failure because of the nutrient-deficient, acidic soils of these forests. Nevertheless, many commercial agricultural projects are still carried out on rainforest lands, although many of these revert to cattle pasture after soils are depleted. Some floodplain regions, like those of the lower Amazon (várzea), are more suitable for commercial agriculture because annual floods replenish nutrient stores. Generally forest clearers use slash-and-burn techniques to clear land, but on a much larger scale than traditional practices. Instead of burning a mere 2-10 acres (1-4 ha), agriculturalists burn hundreds to thousands of hectares after felling a tract of forest and leaving it to dry. Burning releases nutrients locked up in vegetation and produces a layer of nutrient-rich material above the otherwise poor soil. The cleared area is quickly planted and supports vigorous growth for a few years, after which the nutrient stock is depleted and large amounts of fertilizer are required to keep the operation viable. Fertilizer may be washed into local streams, affecting fish and aquatic life. When the use of fertilizer is deemed no longer efficient, the land is abandoned and allowed to revert to scrub. Drought-resistant grasses may move in or cattle ranchers may plant imported African grasses for cattle grazing. The land is now only marginally productive and a limited number of cattle can subsist in the area. When the land is suitable for agriculture, generally large single cash crops like rice, citrus fruits, oil palms, coffee, coca, opium, tea, soybeans, cacao, rubber, and bananas are cultivated. Some of these crops are better adapted to such conditions and last longer on cleared forest lands. However, there are several problems with this type of monoculture (single crop plantations) in the tropics, besides the loss of forest. First, such planting of a single crop makes the crop highly vulnerable to disease and pests. In natural rainforest, widespread infestations are rare because individuals of a given species are widely dispersed. Second, the planting of monocultures can be economically risky with the price fluctuations so common in international commodities markets. Additionally, a single cold spell or drought can devastate a substantial segment of the agricultural economy. The cultivation of some of these crops in mountainous, watershed areas has adverse effects for the environment, notably the alteration of water cycles and erosion. In Peru, the cultivation of coca plants (containing the basic ingredient for cocaine) was so widespread in the Andean foothills during the 1980s and 1990s that Peruvian river flood cycles were altered in some areas, making the high-water season unpredictable. The most serious environmental concern (other than deforestation) stemming from the cultivation of coca is the dumping of chemicals (including kerosene, sulfuric acid, acetone, and carbide) used to process coca leaves. However, stopping coca cultivation is nearly impossible due to simple economics: no crop outperforms coca. In some parts of the world, large-scale commercial agriculture takes up the majority of the productive floodplain and volcanic soils, while leaving smaller farmers little choice but to cut farmland from the rainforest. The ownership of these large commercial farms is concentrated in the hands of a wealthy minority, who may benefit from tax incentives to leave some of their land fallow and not fully employed at any given time. These large farm businesses generally do not employ large numbers of locals, though when they do, workers are used seasonally for low wages. In recent years, grain production in Brazil and other Latin American countries has widely accelerated. However, most of the money ends up in the hands of a few large landowners who, in more marginal areas, have relied on subsidies to survive the harsh soil and climate conditions. Only through these handouts have these landowners been able to turn a profit. Soy production in the Amazon exploded in the early 1990s following the development of a new variety of soybean suitable to the soils and climate of the region. Most expansion occurred in the cerrado, a wooded grassland ecosystem, and the transition forests in the southern fringes in the Amazon basin, especially in states of Mato Grosso and Pará — direct conversion of rainforests for soy has been relatively limited. Instead, the impact of soy on rainforests is generally seen to be indirect. Soy expansion has driven up land prices, created impetus for infrastructure improvements that promote forest clearing, and displaced cattle ranchers to frontier areas, spurring deforestation. In recent years soy growers, crushers, and traders have taken steps to reduce the environmental impact of their crop in the Amazon biome. After a damaging Greenpeace campaign in 2006, leading players in the industry agreed to a moratorium on soy grown on newly deforested lands. Independent analysis has shown that growers are mostly abiding by the ban: only 12 of 630 sample areas (1,389 of 157,896 hectares) deforested since July 2006 — the date the moratorium took effect — were planted with soy. Certain types of palm trees produce large red fruit which are rich with oil. After refining, this oil, known as palm oil, can be used to produce all sorts of products, including oils used in foods like chocolates and cookies, cosmetics like makeup, and even biodiesel, a fuel that can be used in cars instead of diesel. Oil palms, as these trees are called, have very high oil yields -- some of the highest of any crop used for biofuel (plant-based fuel) production. A single hectare (2.5 acres) can produce up to 7 tons of oil, many times what would be produced from the same area of corn, soy, or canola. Given its high yield and the many uses for its oil, it may seem that oil palm is a great solution to dwindling supplies of fossil fuels and concerns about global warming. However, there are problems is some places where palm oil is being produced, specifically the tropical rainforests of Malaysia and Indonesia. Nearly 90 percent of global palm oil production was in Malaysia and Indonesia in 2010. Although much of this production took place on land long ago established for agriculture, some of it occurred in areas that were newly cleared specifically for oil palm cultivation. In fact more than half of plantations established since 1990 in those two countries has occurred at the expense of natural forest. The most threatened ecosystems by expansion of oil palm plantations are rainforests and peatlands. Peatlands are swampy areas where the soils are made of peat — decomposed vegetation. Peat acts as a sponge, soaking up water and helping prevent floods. It also stores large amounts of carbon. When peatlands are drained, the stored carbon reacts with air to release carbon dioxide into the atmosphere, increasing concentrations of the greenhouse gas. The dry peat then becomes highly flammable, increasing the risk of large-scale fires when plantation developers use fire to clear land and burn agricultural waste. Greenhouse gas emissions also result when rainforest is cleared for oil palm plantations. Worse, oil palm plantations support very low levels of biodiversity, meaning most of the plants and animals once found in the rainforest must either move or perish. Oil palm plantations are not suitable habitat for wildlife and endangered species like the orangutan, the Sumatran rhino, the pygmy elephant of Borneo, and the Sumatran tiger are all threatened by development for oil palm. With available land now dwindling in parts of Indonesia and Malaysia, palm oil companies are expanding into new areas, including New Guinea, more remote parts of Borneo and Sumatra, West Africa, and even parts of the Amazon. The majority deforestation in the Amazon Basin since the 1960s has been caused by cattle ranchers and land speculators who burned huge tracts of rainforest for pasture. Brazilian government data indicates that more than 60 percent of deforested land ends up as cattle pasture. But conversion to cattle pasture isn't limited to Brazil — in the 1970s and early 1980s vast tracts of rainforest in Costa Rica, Honduras, and El Salvador were burned and converted into cattle pasture lands to meet American demand for beef. In Central America, cattle pasture land set aside in the 1970s and 1980s was an especially poor choice because a large portion was located on the minority of fertile rainforest soils (volcanic and floodplain soils). For example, by the mid-1990s, cattle pasture land in Honduras took up over 40 percent of the country's fertile land. Cattle grazing in the tropics is relatively inefficient: initially each hectare of cleared land may support an animal, but after 6-8 years, each animal may require five hectares. Nonetheless, cattle are an attractive option in Latin American rainforests. By simply clearing forest and placing a few head on the land, colonists and developers can gain title to the land in some countries (notably Brazil). They often choose cattle over other options because cattle have low maintenance costs and are highly liquid assets easily brought to market. Additionally, cattle are a low-risk investment relative to cash crops which are more subject to wild price swings and pest infestations. Cattle also don't require much capital. 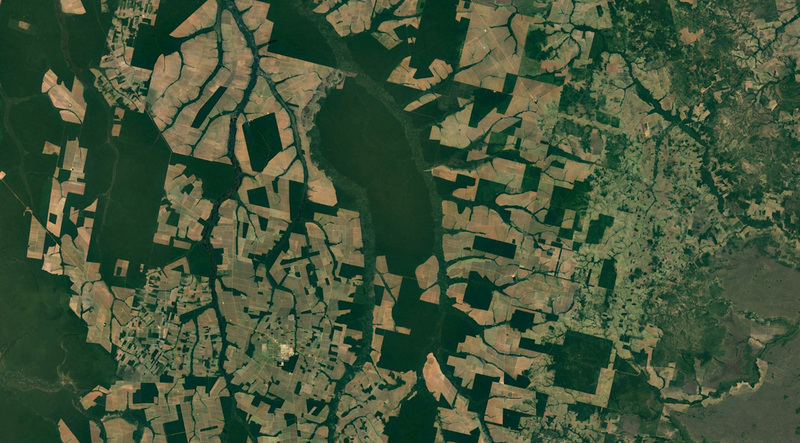 Vast swaths of rainforest are cleared and used for cattle grazing in Latin America for land speculation purposes. The land tenure system in many countries promotes such conversion of land from a natural productive asset to a speculative one by wealthy landowners and speculators. When real pasture land prices exceed real forest land prices, land clearing is a good hedge against inflation, which has been rampant in many developing countries at times in the 1980s and 1990s (2,500 percent in Brazil in 1993, 13,340 percent in Venezuela from 1993-1998). When the growth of land prices is greater than inflation, such land clearing is a good investment regardless of the use of the land. Additionally, at times of high inflation, the appreciation of cattle prices and the stream of services (milk) they provide may outpace the interest rate earned on money left in the bank. Even today with moderate rates of inflation, land clearing for cattle pasture remains a popular activity for land speculators. In parts of the Amazon, pasture land can be sold at a higher price than forested lands. Thus cattle ranching is used as a vehicle for land speculation. Cattle ranchers sometimes work with soy farmers in the Brazilian Amazon. Ranchers — or their agents — clear the land and use it for low productivity cattle grazing. The land is then leased to soy growers, who add lime to the soil to make it suitable for soybeans. After a few years the lease expires and the landowner takes advantage of the improved soil conditions to boost cattle productivity. Ranchers also buy soy as cattle feed. Lake Balbina, a man-made reservoir created to supply hydroelectric power to the city of Manaus in Brazil. (Photo courtesy of Jacques Descloitres, MODIS Rapid Response Team, NASA/GSFC). Click image to enlarge. Large hydroelectric projects — traditionally funded by international aid and development organizations like the World Bank, but increasingly funded by national development agencies and banks like Brazil's BNDES and state-backed banks in China — have led to widespread forest loss. Besides inundating large tracts of rainforest (dams in the lowland areas like much Amazon are generally ecologically inefficient because large tracts of forest are flooded due to the flatness of the basin) and killing off local wildlife, the dams have the effect of destroying aquatic habitats and affecting fish populations, displacing indigenous peoples, and adding carbon to the atmosphere. On top of the ecological damage, several projects have silted up from the erosion resulting from deforestation, rendering the dams inefficient. The reduced water flow downstream disturbs riverbeds and affects floodplain farmers who rely on seasonal floods for nutrients to enrich the soil and kill pests. Thus they may turn to pesticides and artificial fertilizers which have their own negative environmental effects. Diminished water flow can contribute to greater influx of salt water in river deltas, affecting coastal ecosystems essential to fisheries. Hydroelectric projects are also of concern from a health standpoint because they provide opportunities for the spread of disease-carrying organisms including snails (schistosomiasis/bilharzia) and mosquitoes (dengue fever, yellow fever, malaria). Dams are often touted as sources of "green" energy, but in the tropics, recent research suggests this is a misnomer. Dams in the tropics have two principle greenhouse gas emissions sources: carbon released from soil carbon stocks and dying vegetation when the reservoir is flooded and methane formed where organic matter decays under low oxygen conditions at the bottom of the reservoir. Methane emissions are facilitated by a dam's turbines, which usually draw from the bottom of the reservoir and spray methane-dense water into the air upon release. Emissions from rotting vegetation occur on an ongoing basis when the levels of the reservoir fluctuate: during the dry season weeds, emerge from the muddy drop-down zone, only to rot again when waters return. The effect turns a typical tropical dam into a "methane factory", as coined by Philip Fearnside, a scientist who has published widely on the issue. An indirect source of emissions from dams is the activity their electricity powers. For example, several major dams in the Amazon are under construction specifically to power mining operations and agroindustry, both of which can drive deforestation. The case is similar in the Malaysian state of Sarawak on the island of Borneo, where hydropower will fuel new mines, ore refiners, and mills for palm oil and paper production. Despite vocal objections to many dams from civil society and increased awareness among traditional lenders like the World Bank, the number of planned dam projects in tropical regions is growing. On the Mekong alone, one of tropical Asia's biologically richest rivers, some 11 dams are planned by 2030, while 77 hydroelectric projects are in the works for the Mekong Basin. Meanwhile some 150 dams are planned in the Amazon Basin. Forests around the world are affected by air and water pollution, produced from industrial and commercial activities. Besides the pollution caused by oil spills, toxic by-products, and mining accidents, rainforests are seriously degraded by air pollution. Brazil's Atlantic forest was widely damaged in Cubatão (São Paulo state) by pollution during the 1970s and 1980s. Acid rain, which has been increasing in the tropics in recent decades due to growing industrialization, also takes its toll on tropical forests. Dumping of trash and human waste into tributaries from overcrowded cities has resulted in serious pollution in many tropical countries. In some areas, rivers are no longer safe for human use, while plant and animal life suffers. Fertilizers and pesticides used in agricultural areas adjacent to forests can take a toll on rainforest wildlife, including critical pollinators and seed dispersers. Overuse and misapplication of nitrogen fertilizers can cause "dead zones" of low oxygen content in river deltas and the ocean. Since chemicals tend to accumulate up the food chain, top predators are likely to be most affected by any toxic substances used in pesticides and fertilizers. For example downstream of mining areas in the Amazon scientists have found high concentrations of mercury. Urban and residential area expansion cause significant forest loss, both in the consumption of building materials and as a source of land. While urbanization can reduce direct pressures on forests by the migration of rural residents to population centers, urban and suburban sprawl can be damaging when they occur in frontier settlements and boomtowns. A single gold or gem find can quickly swell a population of a remote forest outpost as a sea of prospectors rush to the area in hopes of finding riches. Centrally planned urban experiments has resulted in tremendous forest loss in parts of the world. Indonesia's massive transmigration program moved some 730,000 families—more than six million people—to the outer islands of New Guinea, Borneo, Sumatra, and Sulawesi in an effort to reduce population pressures on the crowded central islands of Java and Bali. The program was generally seen as a failure since many colonists failed to establish successful farms in the hinterlands while large areas of primary forest were cleared. Today some of the worst fires in Indonesia occurs on these once-forested lands. Conflicts between migrants and original inhabitants remains a problem, especially in places like Indonesian New Guinea. Rural abandonment can also spur outright conversion of forest by industrial farmers and ranchers, especially in areas suitable for large-scale agriculture. For example, research published in 2007 found that in area where small farmers in Bolivia and Panama have moved to cities, their holdings have not reverted to forest but instead been converted to larger, more intensive agricultural use. Meanwhile in Sumatra and Indonesian Borneo, agroforests once managed by local communities have been widely cleared by palm oil developers and pulp and paper companies. Humans have long hunted wild game from forests, but over the past 50 years commercialization of killing has triggered a rapid increase in wildlife depletion. Hunting and poaching cause damage to the rainforest ecosystem by removing species key to the system's functioning. The loss of a certain single species can mean extinction for many others. Hunting of seed dispersers and pollinators can influence the structure of a forest. According to research from Central Africa, heavy bushmeat hunting alters forest composition by favoring small-seeded trees over large-seeded, leading to lower tree diversity of trees that have big seeds. The wildlife harvest takes a staggering number of animals: every year in the Brazilian Amazon alone, where 9.6 to 23.5 million mammals, birds, and reptiles are harvested. The annual harvest in the tropical forests of Africa may be 6-12 times that amount, since illegal poaching in Africa is rampant to provide meat for poor rural and urban dwellers. In Asia, tiger populations have been dramatically reduced due to widespread habitat loss and Chinese demand for traditional medicinal products made from tiger parts. Endangered Sumatran elephants are increasingly poached for their ivory and could go extinct within 50 years at present hunting rates. In Indonesia, where there is a thriving black market for endangered wildlife, orangutans are suffering from both habitat loss and the illegal trapping of baby orangutans for the pet trade. Typically, mother orangutans are killed since they refuse to abandon their young. In Brazil, Colombia, Nigeria, Madagascar, and other countries, the collection of wild animals for the pet trade takes its toll on local animal populations. Although such collection can be done in a sustainable manner, it rarely is. Reptiles are the fourth biggest commodity after drugs, diamonds, and weapons in the world smuggling trade, but losses are quite high: less than 10 percent of all animals exported illegally make it alive to their final destination—usually a small, dirty terrarium. Average wildlife harvesting rates of large mammals (>1 kilogram adult body mass) in tropical forests are about 6.0 animals per square kilometer per year in Southeast Asia (2 studies), 17.5 animals in Africa (2 studies), and 8.1 animals in Latin America (5 studies) according to data derived from J. Robinson and E. Bennett, Eds., Hunting for Sustainability in Tropical Forests (Columbia University Press, New York, 1999). Chart and photo of a young gorilla in Gabon by Rhett A. Butler. These rough estimates, showing that millions of animals are killed each year in Africa, Asia, and the Amazon for subsistence hunting and the bushmeat trade, are extrapolated from J. Robinson and E. Bennett (1999) data, forest cover figures from the U.N. Food and Agricultural Organization for 2005, and numbers in J. Robinson and K. Redford, Eds., Neotropical Wildlife Use and Conservation (University of Chicago Press, Chicago, IL, 1991);. The numbers include mammals, birds, and reptiles. Estimation, chart and photo of a red howler monkey in Colombia by Rhett A. Butler. Please note that these are only rudimentary estimates -- there are presently no reliable projections for the number of animals hunted each year. While not directly responsible for deforestation, the introduction of foreign plants and animals can cause severe damage to rainforests, especially in delicate ecosystems like islands. These feral species bring new diseases and compete with local species. The bird life of Guam and Hawaii has suffered from the introduction of alien species [Invasive species news]. In the case of Guam, the culprit was a snake, while in Hawaii the mosquito and domestic chickens were responsible for the decline of native birds. Since the arrival of the Polynesians, at least 62 endemic bird species have disappeared from Hawaii. It is even more startling that Hawaii has more alien plant species than native ones. Alien weeds can choke out endemic plants, especially under disturbed forest conditions like agricultural clearing. Additionally, alien species can wipe out endemic keystone species that play an important role in the ecosystem, like pollinating certain tree species. The elimination of such an endemic species can spell the end for the tree species and a host of other dependent plant and animal species. Climate change is expected to increase the number of alien species in some ecosystems. Tourism can have negative environmental and social effects on the rainforest and its inhabitants. The growing interest in travel to developing countries has spawned a boom in the construction of resorts and hotels on rainforest and mangrove forest lands. Demand by these hotels for tropical hardwood provides another market for woods logged from primary rainforest. Some hotels lack proper waste management and instead send sewage and trash a few hundred yards offshore where it can spawn algae blooms, affecting coral reefs and contributing to eutrophic dead zones. Tourists can have profound social effects on local and indigenous communities. In vying for tourist dollars, traditions can be forgotten and conflicts can arise between members of the community. In some areas, poor villagers turn to prostitution to earn cash from tourists. If tourism is going to provide long term benefits to local people it must be sustainable. The construction of roads to access logging, oil, and mining sites in the rainforest opens vast stretches of forest to exploitation by landless peasants who are responsible for the majority of rainforest destruction today. Generally these roads are funded by governments and development agencies, but some are also financed by private development interests. One of the most famous projects is the Trans-Amazonian highway in Brazil, which opened up Roraima state to widespread invasion and deforestation by miners and colonists. A new road project in South America that links Amazon outposts in Brazil to Pacific Ocean ports in Peru is of great concern to environmentalists and indigenous-rights groups. The road—known as the "Interoceanic highway" -- runs through the state of Madre de Dios in southeastern Peru, an area of extraordinarily diverse rainforest. The road has already been linked to a surge in illegal logging and mining. The project was completed in 2011. Roads in Latin America and other parts of the world are increasingly the result of political pressure from corporate interests, namely loggers, mining companies, oil and gas developers, and industrial agricultural firms, rather than government-backed poverty alleviation and development efforts. In the Amazon, the powerful cattle and soy lobby has pushed for infrastructure development so ranchers and farmers can convert remote forest areas and get their products to market faster and at lower cost. Roads in mountainous regions have added impacts, including exacerbating landslides and soil erosion. FAO estimates that 40 percent of the world (2.6 billion people) rely on fuelwood or charcoal as their primary source of energy for cooking and heating. Fuelwood consumption has increased 250 percent since 1960 (the world's population only increased by 90 percent since 1960). The collection of fuelwood and building material from the rainforest remains an important cause of deforestation by settlers. For example, in the 1990s Honduras relied on the burning of fuelwood for 65 percent of its energy, while in some African nations the percentage is even higher. In the late 1990s the refugee camps, full of some 750,000 refugees, in eastern Congo depended on the collection of fuelwood from Virunga National Park, the mountain gorilla reserve. In just a few months over 20,000 acres of park were cleared for fuelwood and building material. In many parts of the world, charcoal production is a major commercial enterprise. In the Amazon, iron smelters create substantial demand for rainforest wood. Habitat fragmentation is a serious threat to biodiversity and patches of forest worldwide (also see sections 9 and 10). As great expanses of forest are increasingly chopped into smaller blocks, edge effects alter the the flora and fauna of forests. Fragmented patches of forest are subject to drying winds that increase the frequency of tree falls. Tree falls tear gaps in the canopy, destroying its function of moderating the humidity, temperature, and heat conditions of the forest floor. These changes affect the species that inhabit the forest patch, usually reducing diversity. Many rare species that dwell in the deep primary forest are unable to cope with the new conditions and are replaced by more common, weedier species. The drier forest conditions also mean that agricultural fires set in the surrounding scrubland and savanna are more likely to burn through the forest patch. During the Indonesian and Brazilian fires of 1997 and 1998, such forest patches went up in smoke at an alarming rate. Fragmented forests also suffer a loss of biomass—up to 36 percent—in the first few years after fragmentation. Global climate change initiated by global warming is expected to have wide-ranging effects for tropical rainforests (also see section 9). Changes in weather patterns, rainfall distribution, and temperature will result in the transformation of rainforest into drier forest in some areas and the conversion of other forms of forests into tropical forest. Should sea levels rise, large tracts of coastal lowland rainforest and enormous areas of mangrove forest will be affected. Additionally, though tropical forests and their species have lived through significant climate changes in the past (Pleistocene and Holocene epochs), they have less resilience to climate change in the future due to fragmentation and degradation from human activities. In response to global climate change, ecological communities will need to migrate, an effort that will be more difficult because of habitat alteration and fragmentation. Climate models are still far from perfect, but recent simulations paint a mixed picture from tropical rainforests. In the Western Amazon, rainfall may increase, but the southern and eastern parts of the Amazon Basin are expected to experience higher temperatures and less rainfall. In Southeast Asia, warmer and drier conditions are projected for the island of Borneo. In contrast, parts of the African Sahel and coastal East Africa may have more precipitation. Most models project an increase in extreme weather with warming climate. In the 1980s, 1990s, and early 2000s, debt was driving commercial deforestation in some developing tropical countries, especially those classified as Heavily Indebted Poor Countries (HIPCs). Strapped for cash, these countries turned toward their natural resources as the fastest and easiest way to service debt and interest payments. Readily available without capital investment or skilled labor, often non-renewable, forest products like mineral wealth, timber, oil, and hydroelectric power were liquidated in an effort to raise much-needed funds. While efforts in the last decade have sought to reduce or eliminate debts of the world's poorest countries (World Bank / IMF), debt payments still are an important factor in the need for governments to pursue and exploit natural resources an unsustainable manner. The origin of international debt varies from country to country, but many borrowed heavily during the 1970s in an attempt to offset the rising price of oil and to keep their economies growing. Other debts were initiated by struggles for independence and civil wars that followed. Debt increased with the reign by corrupt, heavy-handed governments, which at times used loans to purchase weapons or to finance wasteful or ill-conceived projects that neither benefited the majority of the population, the economy, nor the environment. High interest rates coupled with the global recession made it harder for developing countries to pay off debt. Historically, much of the foreign aid flowing into such countries from multilateral lending organizations like the World Bank and the International Monetary Fund (IMF) financed projects that result in the destruction of the rainforests and thus further ensured future impoverishment and dependence on aid. These organizations funded such projects because they were best suited to large development projects. However since the mid-2000s, drivers of debt having been changing. Today it is private sector investment that has been pushing commercial exploitation of forests. In some countries like Brazil, state-run banks and development institutions play an important role in financing activities that have a major impact on forests. Accordingly, NGOs and environmentalists have been targeting these entities in an effort to push them to adopt lending safeguards. For example, BNDES, Brazil's massive development bank, and the state-run Banco du Brasil now offer reduced interest loans for farmers and ranchers who prove compliance with national environmental laws. The financial sector — whether it is state-run banks, multilateral development banks, of private financiers — play a fundamental role role in funding projects that drive deforestation and forest conversion. The ultimate driving force behind all deforestation is human overpopulation; both the population in the temperate region that places demands on the resources derived from the tropical rainforests, and the expanding population of developing tropical nations, who exploit the rainforest for survival. As of 2012, the world's population exceeds 7.2 billion people. Each minute another 148 people were added to the planet, each day another 214,000, and each year another 78,000,000 (2011 data). Despite declining global birth rates, which have now fallen to the lowest level in recorded history, the U.S. Bureau of the Census projects the population will reach 8 billion by 2026 and expects the population to then level off at 9-10 billion in 2050, barring an outbreak of a widespread deadly plague or a catastrophic environmental disaster. Over 99 percent of this new growth will occur in the less-developed countries of today. Whether one subscribes to the Malthusian view or not, this increase in human population will place tremendous pressure on the planet's resources. The most pressure will come from the world's developing countries, which have the fastest-growing populations and most rapid industrial growth. The rapid economic transformation of India and China will present one of the greatest challenges to managing future resource consumption and environmental sustainability. Despite economic growth in developing countries, they continue to be challenged by poverty and hunger. One in seven people in the world lacks sufficient food to fulfill basic daily requirements, despite increasing food supplies worldwide. There are many reasons for this hunger, including the increasing cost of food against falling real wages and the limited access to food reserves. To meet projected food demand, the FAO estimated in 2005 that another 222 million acres (90 million hectares) of new land must be brought into agriculture in developing countries, mainly in sub-Saharan Africa and Latin America. The good news is there are 800 million to 1.6 billion hectares of degraded land worldwide that could be suitable for agricultural production. Cultivating these lands could reduce pressure on critical ecosystems including rainforests, peat swamps, and high-biodiversity savannas. Additionally, as developing countries become more integrated into the world economy, they will place greater demands on their own natural resources and as a result, pollution and environmental degradation in recent decades have been growing at a rate exceeding the population growth rate. For example, during the 1980s, the population of tropical developing countries grew by roughly 19 percent, while their deforestation expanded by 90 percent. Industrial demand increases for wood, oil, and mineral products found on forest lands. One of the greatest threats to the world's environment is the compounding numbers of rural poor who turn increasingly to the rainforests to feed and shelter themselves. These poor farmers are sometimes pushed off more fertile soils by large, wealthy landowners who are capable of purchasing land or using political influence to gain title to land. Without realizing it, these poor farmers are perpetuating their own situation by their role in deforestation, which worsens their quality of life by increasing their chance of disease, degrading their drinking water stocks, escalating soil erosion, and leaving their children without the benefits of sustainably utilized forest. As the human population grows, the quality of all forms of life plummets as people are forced to move into more and more marginal lands with higher incidence of natural disasters (floods), crop failures, and disease. Misdirected consumption in wealthier countries contributes to rainforest destruction in tropical countries. For example, during the 1970s and 1980s American demand for cheap beef triggered the clearing of vast stretches of rainforest in Central America and Brazil. Similarly, demand for certain forest products like tropical hardwoods, glossy paper, and inexpensive particle board gives impetus for companies to exploit forest stocks. The top 20 percent of the wealthiest countries consume a disproportionate amount of of world resources. Excessive energy use and waste in the developed countries means that each person in the north has a much greater impact on the earth's environment than each person in developing countries. Each child in Britain produces as much carbon dioxide and pollution as 30 born in Bangladesh in a given year. Therefore, the 58 million people added to the Earth in developed countries during the 1990s polluted more than the 915 million people added in developing countries during the same period. In other words, with current consumption patterns, overpopulation in the United States (population growth rate 0.9 percent) is more of a threat to the Earth's environment than overpopulation in Uganda (population growth rate of 3.6 percent). Global human population is expected to level off below 10 billion by 2050, but no one knows when humanity will pass through the global consumption bottleneck. It could well be another century or two before our consumption levels begin to recede, raising the question of whether the planet's ecosystems, and other species, will survive humanity's burgeoning footprint. The world's tropical rainforests are threatened by short-term economic exploitation of their resources and pressures from the rural poor. These short-term demands incur long-term costs, which are still largely unrealized and unknown. Because it is easier and appears more economical to clear the forest in the short run, our future quality of life is compromised. The consequences of our actions are the focus of the next section. 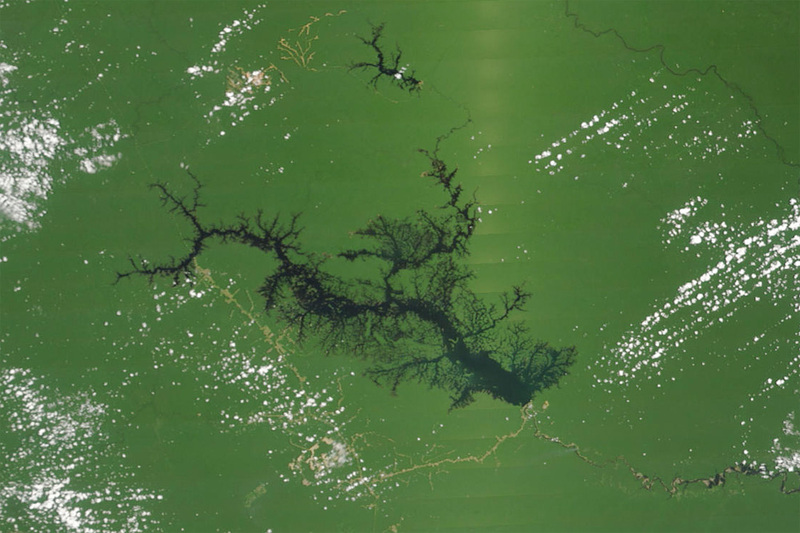 NASA photo of fishbone deforestation in the Brazilian Amazon. What is the difference between deforestation and forest degradation? What are some examples of activities that cause deforestation? What are some causes of forest degradation? What are some natural causes of rainforest destruction? How could climate change threaten rainforests? Why do colonists and poor farmers destroy the rainforest? How does globalization affect deforestation? How do oil operations impact the rainforest? How can oil development actually hurt an economy? Why can selective logging be destructive in the rainforest? What is the hunting of wild animals for food called? How does mining affect the rainforest and local rivers? Why are forest fires getting worse in the Amazon? What is the impact of war on deforestation? How can war result in more deforestation? Less deforestation? How does large-scale agriculture damage the rainforest? Why are soybeans generally bad for the Amazon? Are palm oil-based biofuels a threat to rainforests? What is the largest source of deforestation in Latin America? Why do land speculators clear rainforest? What environmental problems can dams cause? How can alien or invasive species impact the environment? What is an important energy source for rural poor in the tropics? Why is forest fragmentation bad for rainforest biodiversity? How will climate change effect the distribution of rainforests? How does international debt impact deforestation in the tropics? How does population growth impact the environment? How can a falling population growth rate in developed countries still result in deforestation and other environmental problems? How does consumption in the United States affect rainforests on the other side of the world? In 1999, lava flows destroyed sections of rainforest in Cameroon (AP: "Lava from Cameroon volcano threatens rain forest," 3/30/99). Wright, S.J. et al. ("The El Nino Southern Oscillation, Variable Fruit Production, and Famine in Tropical Forest," Ecology, Vol. 80, No. 5, (1632-1647) 1999) discuss the effect of El Niño in tropical forests of Central America (Barro Colorado Island, Panama). The paper examines the role of photosynthetically active radiation in fruiting and notes periods of famine among frugivorous mammals in years following dry ENSO events. Similar conclusions were reached in a paper by Ashton, P.S., Givnish, T.J., and Appanah, S. ("Staggered Flowering in the Dipterocarpaceae: New Insights into Floral Induction and the Evolution of Mast Fruiting in the Aseasonal Tropics," The American Naturalist Vol. 132, No. 1, July 1988. Here the authors found a strong correlation between mast fruiting of Dipterocarps and the drought conditions of ENSO events. Brookfield, H., Potter, L., and Byron, Y., (In Place of the Forest: Environmental and Socio-economic Transformation in Borneo and the Eastern Malay Peninsula, New York: United Nations University Press, 1995) give the historical background on the section of forest in the northwestern part of peninsular Malaysia damaged by heavy winds in 1880. The study in the 1950s which found the forest had still not recovered is documented in Wyatt-Smith, J. "Storm forest in Kelantan," Malayan Forester Vol. 17: 5-11, 1954. Markham, A. et al. ("Climate Change and Biodiversity Conservation," the World Wildlife Fund, 1996) note the projection that recovery for Luquillo montane forest from Hurricane Hugo will take at least 250 years. The FAO definition of deforestation comes from State of the World's Forests 1997 (SOFO) published by the United Nations Food and Agriculture Organization (FAO). N. Myers breaks down the causes of deforestation in "Deforestation Rates in Tropical Forests and Their Climactic Implications," Friends of the Earth, London, 1989. Thoenes, S ("In Asia's Big Haze, Man Battles Man-Made Disaster." The Christian Science Monitor. 10/28/97) notes that under Indonesia's transmigration program, the government has moved more than six million people from the central islands. Brookfield, H., Potter, L., and Byron, Y., examine the Indonesian transmigration program in their work In Place of the Forest: Environmental and Socio-economic Transformation in Borneo and the Eastern Malay Peninsula, New York: United Nations University Press, 1995. The section on Texaco's activities in Ecuador is based on writings by Epstein, J. "Ecuadoreans Wage Legal Battle Against US Oil Company." The Christian Science Monitor. 9/12/95; Goering, L., "Rainforest Residents Sue Texaco-Drilling Left Mess in Ecuadorean Jungle," The Washington Post, 7/16/96; Kane, Joe, Savages, New York: Alfred A. Knoff, 1996; Lawrence, D.A., "When forest people defy big oil," The Christian Science Monitor. 2/23/99. Sternberg, H.O. ("Waters and wetlands of Brazilian Amazonia: an uncertain future" in T. Nishizawa and J. I. Uitto, eds. The Fragile Tropics of Latin America: Sustainable Management of Changing Environments, New York: United Nations University Press, 1995) touches upon the potential severity of an oil spill in the Amazon. Moffat, D. and Lindén, O. examine oil operations and compensation schemes for locals in the Niger River Delta in "Perception and Reality: Assessing Priorities for Sustainable Development in the Niger River Delta," Ambio Vol. 24 No. 7-8 (527-538), Dec. 1995. A brief history of the international timber industry is provided in Brookfield, H., Potter, L., and Byron, Y., In Place of the Forest: Environmental and Socio-economic Transformation in Borneo and the Eastern Malay Peninsula, New York: United Nations University Press, 1995. The Sarawak Campaign Committee in "Japan's Tropical Timber Imports in 1994 and 1995," Mori no Koe Issue #8, 4-25-96, provides statistics for Japanese tropical hardwood log imports. The sudden increase in logging in new markets by multinational firms was covered extensively by the popular media in the mid- to late-nineties including Mittermier, R., "Economic Crisis in Suriname threatens Ecological Eden," Christian Science Monitor, 4/19/95; Friedland, J. and Pura, R., "Log Heaven: Trouble at Home, Asian Timber Firms set Sights on the Amazon," Wall Street Journal, 11/11/96; Barry, G., "Asian Loggers Move into Heart of Amazon Rainforest," BIOD Campaign News, 3/10/97; and Ito, T.M. and Loftus, M., "Cutting and Dealing," U.S. News and World Report, 10-Mar-1997. The failure of many tropical logging operations to safeguard timber stocks for future harvests and to protect logged-over forest from destruction is explored by Frumhoff, P.C. in "The elusive prospect of sustainable forestry," Trends in Ecology and Evolution, Vol 13, issue 4 (166-167) 1-April-1998; by EDF in "Making the Label Stick," The Environmental Defense Fund, 1997; and by Johns, A.G. in Timber Production and Biodiversity Conservation in Tropical Rain Forests, Cambridge University Press, 1997. S. Rosse gives his account of an illegal logging network in "Thai Forestry Rangers at Work," The Christian Science Monitor, 8/2/93. The illegal timber trade in this region is further documented in The Bangkok Post, "Log Poaching," 11/7/97; Skehan, C., "Forest Carnage," Sydney Morning Herald. 2/28/98; Skehan, C., "Army Denies Involvement in Logging Scandal" Sydney Morning Herald. 2/26/98; Wannabovorn, S., "Thai Opposition Plans Censure Motion Against Government," Reuters, 2/25/98; Agence France-Presse (AFP) "Cambodia Could Soon Lose Forests to Loggers: Green Group," 12/15/97; Baker, M., "Cambodia-Military Involved in Illegal Logging," Sydney Morning Herald, 1/24/97; and Pruzin, D., "Politics of Timber-Loggers Use Loophole to Decimate Cambodia's Disappearing Forest," Christian Science Monitor, 5/1/97. Suksai, S. and Hutasingh, O. ("Working elephants fed with amphetamine-laced bananas" Bankok Post, 6/15/97) report that elephants used for illegal logging were fed amphetamines to increase their productivity. Bawa, K.S. and Seidler, R. ("Natural Forest Management and Conservation of Biodiversity in Tropical Forests." Conservation Biology Vol. 12 No. 1 (46-55), Feb 1998) cite studies that suggest logging to any degree, even if it is highly selective, reduces global biodiversity. McRae, M discusses the impact of high interest rates on logging in "Is 'Good Wood' Bad for Forests?" Science Vol. 275 (1868-1869), March 1997. K. Horta provides a description of a logging operation in the Congo in "Why I was Banned from a Congo Rainforest," Christian Science Monitor, 11/25/96. J.N. Abramovitz reviews the low logging concession fees in Suriname and Belize in "Taking a Stand: Cultivating a New Relationship with the World's Forests," Worldwatch Institute 1998. R. Mittermier ("Economic Crisis in Suriname threatens Ecological Eden," Christian Science Monitor, 4/19/95) mentions estimates from the US Forestry Service and Harvard Law School that project revenues for Suriname from a recent logging agreement. The fact that most tropical timber is harvested for domestic consumption - and not export - is reviewed in Atkin, J., "Tropical timber," Economist, 13 February 8, 1993 and Vincent, J. R., "The tropical timber trade and sustainable development," Science 256 (16511655), 1992. Vincent 1992 also notes that international trade accounts for a diminishing share of tropical timber consumption. Dudley, N., Jeanrenaud, J., and Sullivan, F. ("The Timber Trade and Global Forest Loss." Ambio Vol. 27, No. 3, May 1998) notes that most analyses concentrate on deforestation and overlook forest degradation. They also cite a recent finding of the World Wildlife Fund that logging has become the primary cause of forest loss (road construction for logging activities included) today and suggest most commentators underestimate importance of industrial activities on deforestation. Information on mahogany logging is provided by the Rainforest Action Network (1992-1997). F.S. Kolma, ("FIA refuses to pay K10 royalty," The National (PNG), 11-Jul 1996) reports on the government's failure to enforce an excise tax on timber. L. Weiss ("Nigerians Risk All Their Forests," NGO Coalition for the Environment (NGOCE), Earth Island Journal, 1996) notes the tremendous profit margins of a Hong Kong logging firm in Nigeria on African mahogany trees. Vincent, J.R. and Gillis, M. ("Deforestation and Forest Land Use: A Comment," The World Bank Research Observer, vol. 13, no. 1 (133-140), Feb. 1998) argue that rates of deforestation can be above optimal levels due to policy distortions. G. Barry identifies a study by the International Tropical Timber Organization (a UN body), found that none of 34 sites in the Para state of Brazil had met ITTO harvesting requirements Brazil has agreed to implement by the year 2000 ("Asian Loggers Move into Heart of Amazon Rainforest," BIOD Campaign News, 3/10/97). The impact of the 1997-1998 economic recession in Asia on logging operations is presented in ITTO literature (1998-1999) and Vulum, S., "Logging in PNG: The axe falls," Pacific Island Monthly (Fiji), March 1998. The use of Indonesia's reforestation fund for alternative projects such as propping up a failing car plant is examined by Richardson, M., "Indonesian Crisis Prompts Fears of New Smoke Pollution," International Herald Tribune, 2/13/98. Accounts of the Guyana cyanide spill of 1995 are found in World Rainforest Movement, "Guyana: Logging Freeze Starts to Melt, More Mining," 3/14/96 and Bretton Woods Reform Organization (BWRO), "A Call for Accountability for Poisonous Cyanide Discharge," 8/28/95. Examples of environmental degradation caused by Freeport mine operations in Indonesia is presented by Chatterjee, P., "Human Rights-Indonesia - US mining giant implicated in Indonesia atrocities," 1995; Press, E., "Freeport: Corporate Predator," The Nation. July 31/August 7, 1995; and Walsh, P., "Witnessing 'GP?K' Drama, blood, and tears of Jo-Mun Nerk's Children in the Freeport Concession Area," Australian Council for Overseas Aid, 1995. The Rainforest Action Network (1993-1995) described the Yanomani situation including malaria and armed conflicts between miners and the Yanomani. Gold mining in the Amazon rainforest is covered in Nigel J.H. Smith, Emanuel Adilson S. Serro, Paulo T. Alvim, and Italo C. Falesi, Amazonia - Resiliency and Dynamism of the Land and its People, The United Nations University, 1995. Pfeiffer, W. C. and L. D. de Lacerda. ("Mercury inputs into the Amazon region, Brazil," Environmental Technological Letters 9: 325-330, 1988) found that for every kilogram of gold produced, an estimated 1.32 kg of mercury is dumped into the environment. The gold find at Serra Pelada in the Brazilian Amazon is reviewed by Schmink, M. ("Social change in the garimpo," in John Hemming (ed. ), Change in the Amazon basin, Vol. 2: The frontier after a decade of colonisation, Manchester:Manchester University Press, 1985) and Mallas, J. and N. Benedicto ("Mercury and gold mining in the Brazilian Amazon," Ambio 15(4): 248-249, 1986). Pollution and health impacts: Balowski, J., "Suharto Fiddles While Indonesia Burns" Greenleft Weekly, October 15, 1997; Edwards, N., "Public Anger Could Heat up Over Southeast Asia Smog," Reuters, 22-SEP-97; and Gilbert, C., "Indonesia's Peat Smoulders Underground," Environment News Service, 11/13/97; Stolle, F. and Tomich, T.P., "The 1997-1998 fire event in Indonesia," Nature and Resources Vol. 5, No. 3, July-Sep 1999. Economic costs: AP, "Acid Rain and Other Problems Coming Soon for Southeast Asia." 11/10/97; AP, "Malaysia orders experts to keep quiet on haze" 11/7/97; AP, "Drought Cuts Indonesia's Harvests; Haze Worsens in some Parts" 10/24/97; Johnson, C., "Indonesia's Fires Could Cost 5-6 B, experts say," Reuters, 3/17/98; Rajendran, R., "Southeast Asia Fire Damage Estimated at around $4.4 billion," Reuters, 5/29/98; Stolle, F. and Tomich, T.P., "The 1997-1998 fire event in Indonesia," Nature and Resources Vol. 5, No. 3, July-Sep 1999; and Xinhua, "Forest Fires in Indonesia Cause Huge Economic Losses," 10/23/97. Transmigration program: Gilbert, C., "Indonesia's Peat Smoulders Underground," Environment News Service, 11/13/97; MacKenzie, I., "Fire Ribbons Send Smog from Indonesian Peat Bogs," Reuters. 11/11/97; and Thoenes, S., "In Asia's Big Haze, Man Battles Man-Made Disaster," The Christian Science Monitor, 10/28/97. History of fires in Southeast Asia: Balowski, J., "Suharto Fiddles While Indonesia Burns" Greenleft Weekly, October 15, 1997; Leighton, M. and Wirawan, N., "Catastrophic Drought and Fire in Borneo Rain Forests Associated with the 1982-83 El Nino Southern Oscillation Event," in G.T. Prance, ed. Tropical Rain Forests and the World Atmosphere, Westview: Boulder, Colorado 1986; and Nathan, D., "Can you really hope that the haze will go," Singapore Straights Times, 10/5/97. Rosenfeld, D. ("Dense smoke turns off normal tropical rainfall," Geophysical Research Letters, Vol. 26 (3105) 1999) found that dense smoke from the Borneo fires of 1997-1998 completely turned off normal tropical rainfall in some places because moisture was divided among so many droplets that they were too small to fall as precipitation. Forest fires in the Amazon have had extensive coverage in popular media and academic literature in recent years. The Woods Hole Research Center gives an excellent background of fire in the Amazon in its RisQue98 (Risco de Queimada, or "Risk of Burning" in Amazonia - 1998), Several papers in scientific journals examine the extent of fires and how they move from agricultural lands into intact rainforest including: Nepstad, D.C. et al, "Large-scale impoverishment of Amazonian forests by logging and fire," Nature Vol. 398 (505-508), 8-April-99; Cochrane, M.A. et al., "Positive feedbacks in the fire dynamic of closed canopy tropical forests," Science Vol. 284 (1832-1935) 11-June-1999; Cochrane, M.A. "Forest Fires in the Brazilian Amazon." Conservation Biology Vol. 12 No. 5 (949-950), Oct. 1998. Some press articles on the subject include: Simons, M., "Vast Amazon Fires, Man-Made, Linked to Global Warming," New York Times, 8/12/88; Margolis, M., "Thousands of Amazon Acres Burning," Washington Post. 9/8/88; Simons, M., "Vast Amazon Fires, Man-Made, Linked to Global Warming," New York Times, 8/12/88; Wilson, E.O., The Diversity of Life, Cambridge, Mass. : Belknap Press, 1992; Schemo, D.J., "Amazon Jungle Going Up in Smoke Again," New York Times. 10/13/95; Christie, M., "The Amazon Is Burning Again, Officials Say," Reuters. 10/3/97; Donn, J., "Report: Amazon rain forest fading," Associated Press, 4/8/99; and Couzin, J., "The forest still burns." U.S. News & World Report April 19, 1999. Wolanski, E. ("Rwanda National Parks Dying." 1/5/96) accounts for wildlife loss and forest destruction caused by refugees and the military in and around Virunga National Park, Rwanda. Reuters reports on similar wildlife losses in Garamba N.P. at the hands of Sudanese refugees (Reuters, "Sudan's War Threatens Zaire Wildlife with Extinction," 2/14/96). Hart, T.B. and Hart, J.A. ("Zaire: new models for an emerging state," Conservation Biology Vol. 11 No 2. (308-309) Apr. 1997) document the impact of the Congo civil war on parks and park facilities in the former state of Zaire (today known as the Democratic Republic of Congo). Attacks on oil pipelines are a popular means of protest for disgruntled groups. Recently attacks in Colombia (Inter Press Service (IPS) "Environment-Colombia: Garbage, Guerrillas and Animal Smugglers," 1/7/98.) and Ecuador ("Ecuadorean Oil Pipeline Cut by Dynamite Blas," Reuters 11/16/99.) have made news. The outlaw mentality of illegal logging operations is conveyed in S. Rosse "Thai Forestry Rangers at Work," The Christian Science Monitor, 8/2/93. Nigel J.H. Smith, Emanuel Adilson S. Serro, Paulo T. Alvim, and Italo C. Falesi in Amazonia - Resiliency and Dynamism of the Land and its People (The United Nations University, 1995) discuss the suitability of some vàrzea floodplain forests for agriculture. Several authors including Fowler, G. and P. Mooney (Shattering: Food, politics, and the loss of genetic diversity, Tucson, AZ: University of Arizona Press, 1990) and Gentry, A. H. and J. Lopez-Parodi ("Deforestation and increased flooding of the Upper Amazon," Science 210: 1354-1356, 1980) have suggested that widespread deforestation of the Andean foothills has altered Amazonian flood cycles. However this is disputed in Richey, J. E., C. Nobre, and C. Deser ("Amazon River discharge and climate variability," Science 246: 101-103, 1989) using statistical analysis of past flood cycles. Fearnside, P.M. ("Deforestation in Brazilian Amazonia: The Effect of Population and Land Tenure," Ambio, vol. 22 no. 8 (537-545), Dec. 1993) provides a detailed study of deforestation for cattle pastures in the Amazon. Among other statistics, he provides government figures for large scale cattle ranching and discusses the importance of inflation in clearing for land speculation. Dore, M.H.I. and Noguiera, J.M. ("The Amazon Rain Forest, Sustainable Development and the Biodiversity Convention: A Political Economy Perspective," Ambio Vol. 23 No. 8 (491-496), December 1994) further detail the role of inflation and high interest rates in Amazonian deforestation. According to Gradwohl, J. and Greenberg, R., Saving the Tropical Rainforests, Island Press, Washington D.C., 1988, cattle pastures in Honduras take up more than 40% of the nation's fertile land. Nigel J.H. Smith, Emanuel Adilson S. Serro, Paulo T. Alvim, and Italo C. Falesi in Amazonia - Resiliency and Dynamism of the Land and its People (The United Nations University, 1995) discuss why cattle are an attractive investment in the Amazon. Lovejoy, T. E. in "Biodiversity: What is it?" In Biodiversity II. Reaka-Kudla, Wilson, Wilson, eds. Joseph Henry Press, Washington D.C. 1997. notes that the Brazilian Atlantic forest was widely damaged by air pollution in Cubatao during the 1970s and 1980s. Rodhe, H., and R. Herrera, eds. (Acidification in the Tropics, Chichester, England: Wiley, 1988) predict 15% of the world's remaining tropical forests may soon be affected by acid rain. Gates, D.M. Climate Change and its Biological Consequences, Sunderland, Mass. : Sinauer Associates 1993.
warns that a vast area of forest may be adversely affected by UV-B radiation, should the ozone depletion continue. Davis, K. ("Goodall: Illegal Hunting is Biggest Threat to Chimpanzees" A.P. 12/10/97) and McRae, M. ("Road Kill in Cameroon." Natural History. Vol. 107, No. 1, Feb 1997.) provides an overview of the African bushmeat trade. In "Strapped for Cash, Asians Plunder their Forests and Endanger their Future," Effects of the Asian Economic Crisis series, AsiaPacific Issues No. 39, April 1999, Donovan examines the effect of the Asian economic recession on wildlife harvest and concludes that the depressed market conditions spurred an increase in hunting and wildlife collection. Epstein, J. ("For sale: creatures great and small," SF Chronicle 10-7-99) and Saunders, J. ("S.African Police Crack Reptile Smuggling Syndicate," Reuters 10/20/97) explore the illegal pet trade. James, H.F. and S.L. Olson ("Descriptions of thirty-two species of birds from the Hawaiian Islands: part II. Passeriformes," Ornithology Monogr. 46:1-88, 1991) note that 62 bird species have gone extinct since the arrival of the Polynesians in the Hawaiian islands. According to Wagner, W.L., Herbst, D.R., Sohmer, S.H., in Manual of the Flowering Plants of Hawaii, Honolulu: University of Hawaii Press and Bishop Museum Press, 1990, today Hawaii has more alien plant species than native ones. Smith, N.J.H., Rainforest corridors, Berkeley, CA: University of California Press, 1982 explores the Trans-Amazonian highway project. Based on studies in the Amazon, W.F. Laurance concludes fragmented forests may lose up to 36% of their biomass in the first few years after fragmentation ("Dynamics and biomass of Amazonian forest fragments," ITTO Tropical Forest Update Vol. 8 no. 1, 1998). A survey of human disturbance of world ecosystems is found in L. Hannah, et al. "A Preliminary Inventory of Human Disturbance of World Ecosystems," Ambio Vol. 23 No. 4-5, July 1994. Whitmore, T.C. in "Potential impact of climate change on tropical rain forest seedlings and forest regeneration," Climate Change Vol. 39, Issue 2-3 (429-438) 1998 suggests that today's fragmented forests may have less resilience to future climactic change because changes in cyclone occurrence and increased rainfall seasonality may effect seedling ecology. The impact of climate change on tropical forests is further examined in Woodwell, G.M and Mackenzie, F.T., eds. Biotic Feedbacks in the Global Climactic System: Will the Warming Feed the Warming? New York: Oxford University Press, 1995. In Third World Debt and Tropical Deforestation (Binghampton: State University of New York, 1992) Kahn, J.R. and McDonald, J.A. deatils the role of debt in tropical deforestation. Oxfam America Action Alert ("Free Africa from the Debt Trap," 2/15/96) estimate the debt of Sub-Sahara Africa in 1980 at $84 billion and, in 1996, at $210 billion. Myers, N. in "The world's forests: problems and potentials," Environmental Conservation. 23 (2) 1996 estimates that tropical forest countries share two-thirds of the developing world's debt. Current population information comes from the U.S. Bureau of the Census, Report WP/98, World Population Profile: 1998, U.S. Government Printing Office, Washington, DC, 1999. FAO makes predictions on future food-land requirements in State of the World's Forests 1997 (SOFO). Myers calculates that the population of tropical developing countries grew by roughly 19%, while their deforestation expanded by 90% during the 1980s in Myers, N., "Population and Biodiversity," Ambio Vol. 24 No. 1, Feb. 1995. The hamburger connection between cheap beef and rainforest clearing for pasture was popularized in activist campaigns and in Harris, M. ("The revolutionary hamburger," Psychology Today 17(10): 6-8, 1983), Myers, N., ("The cost of a "Big Mac"? Latin America's forests," World Environment Report 6(18): 1-2, 1980), and Nations, J. D. and D. I. Komer ("Rainforests and the hamburger society," Ecologist 17(4/5): 161-167). However this linkage between Amazonian deforestation and demand for fast-food is tenuous at best according to Nigel J.H. Smith, Emanuel Adilson S. Serro, Paulo T. Alvim, and Italo C. Falesi, Amazonia - Resiliency and Dynamism of the Land and its People, The United Nations University, 1995. Primack, R.B., Essentials of Conservation Biology (Sunderland, Mass. : Sinauer Associates 1993) mentions the cassava-animal feed connection to deforestation in Thailand. Myers compares consumption between people in the developing world and the industrialized world calculating that the 58 million people added to the Earth in developed countries during the 1990s will pollute more than the 915 million people added in developing countries during the same period (Myers, N., "Population and Biodiversity," Ambio Vol. 24 No. 1, Feb. 1995).